Lawn Fawn has the MOST adorable products. Every new stamp set we see released, we are dying to use and pair with our wood paper. They have so many cute little animals and critters. This week our wish came true! Isn’t this Dad + Me stamp set from Lawn Fawn the cutest? With the darling woodland critters, perfect little scenes and excellent puns (we are suckers for a good pun), this set is absolutely perfect. Even better … the Dad + Me stamp set has companion dies; Dad + Me Lawn Cuts, making cutting out all of the little stamped images a total breeze. We created this fun general occasion card using this set. We stamped a few of the greetings from the set in Versamark ink on black card stock and then embossed the stamping with white embossing powder to get that black label maker look. 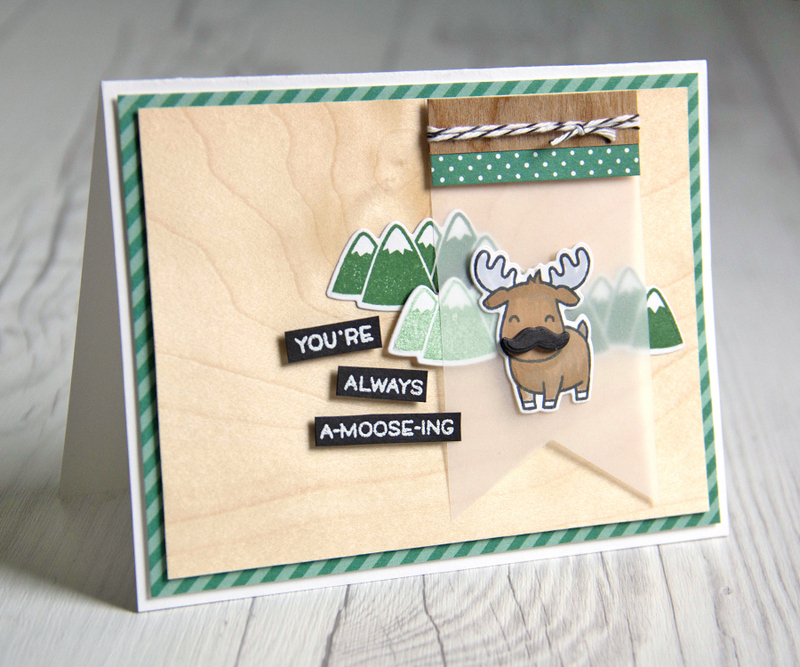 We chopped up the words and arranged them differently to come up with a new ‘a-moose-ing’ greeting. Look at that gorgeous Birch wood grain!!! Doesn’t it look so great with the little mountains and moose? Our wood paper is thin and super lightweight so you can mail this card with a regular postage stamp. Supplies for A-Moose-ing card: Birch Wood Paper, Cherry Wood Tape, Dad + Me stamp set, Dad + Me Lawn Cuts, Let’s Polka in the Dark Petite Paper Pack, white card stock, black card stock, black ink, green ink, Copic Markers, Versamark ink, white embossing powder, heat tool, baker’s twine, vellum paper, foam adhesive and adhesive. Thanks for stopping by. We have more Lawn Fawn goodness to share on Friday. Be sure to check out theLawn Fawn blog this week for more great ideas using their products with our Wood paper! Follow our Lawn Fawn Friends! This entry was posted in DIY Projects, Stationery & Envelopes and tagged ARC, birch, crafts, Lawn Fawn. ANDRIA THOMPSON on Printable Glitter Paper is Amazing! Shop Manager on Printable Glitter Paper is Amazing! Clare Cook on Printable Glitter Paper is Amazing! Rupa Chatterjee on Real Wood Ornaments for Christmas! Kevin Jones on Home Decor and so much more! Sign up today and receive 10% off your first purchase! Copyright © 2019 ARC Papers, LLC. All Rights Reserved. Site designed, developed and managed by Prairie Marketing, Inc.